Disclosure: I received a bike from Linus for review. All opinions are my own. Kenzie loves to ride her bike :: all.the.time. They have bike day at school where all the children bring their bikes and/or scooters to enjoy. 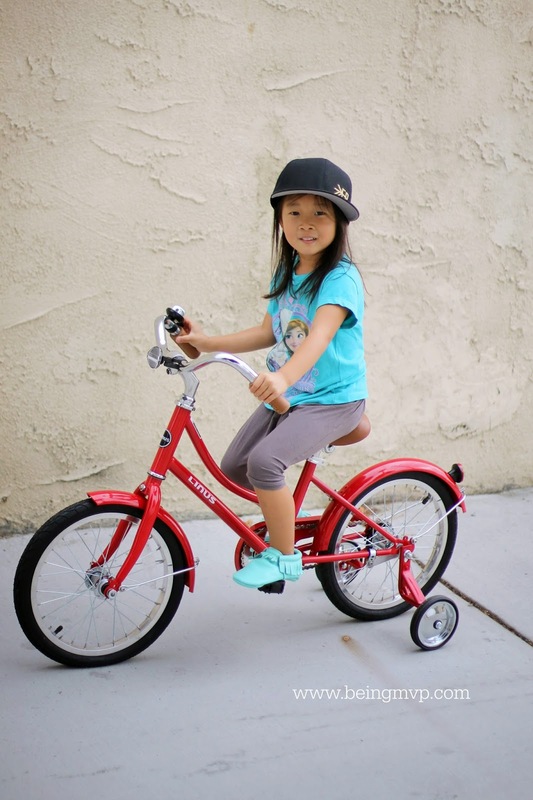 Recently, she has been asking for a bigger bike like her friends so it was awesome watching her face light up when she saw the shiny red Linus Bike Dutchi assembled (at night by Hubs) and ready to ride when she woke up in the morning. Inspired by French bicycle design of the 50s and 60s we have created a bicycle that preserves the simple elegance and pure form of that golden era, but has all the benefits of modern comfort and reliability. LINUS is the utilitarian city bike… simple and reliable, but with a personality and style that makes you feel like you’re in an old French movie. This is a truly beautiful bike that is made with quality materials. The 16 inch version came with training wheels which is great for Kenzie who loves to zoom on by but with a sense of security. *Note the 20 inch does not come with training wheels. 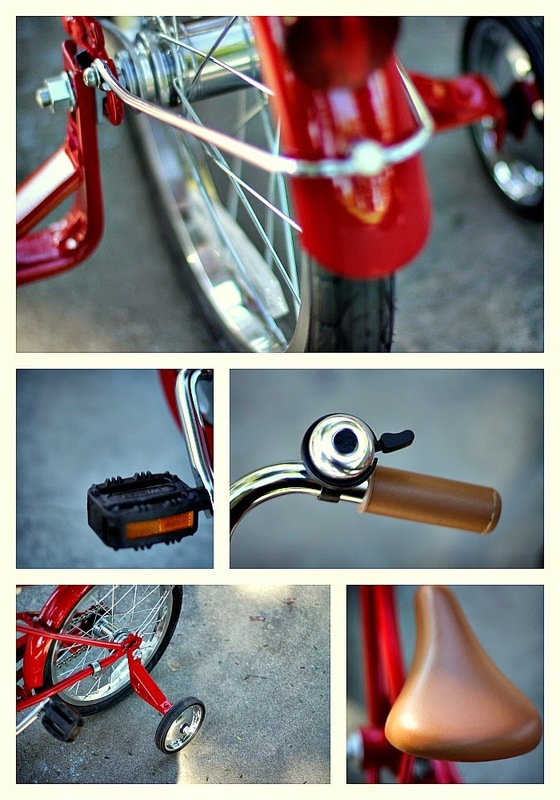 I love the vibrant red color contrasted with the brown faux leather seat and handlebars. Kenzie loves to ring the bell as she rides through the neighborhood. The brake is simple as it just uses the pedals to stop. It was funny watching Kenzie riding the Linus Bike for the first time as she exclaimed that the bike was wobbly. She rides her Dutchi almost every day and pedals along pretty quick as we ride around the neighborhood and park. I want to get her the oval basket to put on the bike to take along her favorite snacks. Check out Kenzie cruising along in her chic Dutchi! Do you have a Linus Bike? If not, which one do you covet? The bell is what would sell my son. He really wants a bike with a bell. I love the classy look and shiny red color. How fun! I LOVE the look of this bike. My daughter would go crazy for that. So cute! We don't have one but my little one is 13 and probably won't fit on any :P Funny that they call it a Dutchi bike but was inspired by the French design. I love that color bike! Red is one of my favorite colors. I also think it is really neat the school has them bring their bikes for a day. How fun! That looks great! My son needs a new bike, checking it out for his Christmas list! That looks like a great bike! I love the color. This bike is so stinking cute! A bike with out cartoons on it for kids is so refreshing! I totally want some of these for my kids! The design is super duper cute. It definitely reminds me of what I had as a child. What a great bike. It's so stylish! That's a very cool bike. I love the old school design. I love this bike! It's so beautiful, and that design is sweet. Love the bike, and love the model. She's really rocking the sideways hat! What a great throwback design. I love it. This bicycle is beautiful. I love the sweeping lines and the classic design. VERY nice. That bike is so nice! I'd love to get this for my little one as a special gift! I love the style of the bike, and the color. And the classic bell makes it worth it. This is a great bike! I love the style and am sure my kids would get a kick out of something like this. This is such a great and stable looking bike! This would be perfect for my grandson who still needs training wheels, too. That looks like one of the bikes I had when I was little. Mine happened to be green. Brings back memories. That is an awesome bike! I want one for me! That is a really neat styled bike. I really love it! Color and all! Beautiful bike! I bet you get a lot of heads turning when you're out riding it. Now this is a bike I would feel comfortable buying for my children. I love the old fashioned look and feel of it and the traditional styling. Love this! I don't have one but I wish my child did. It's such an adorable bike. I had never heard of this brand before. I'll definitely have to look into this with Christmas right around the corner. What a snazzy bike! I love that cool, throwback design. This is such a classic, and classy looking bike! We believe in the amazing freedom and confidence a run bike gives kids.Kids need to be able to balance before they can really ride.This is such a good invention. Your hair looks great with color bike.Lovely website, it loads really quick and appears very awesome.